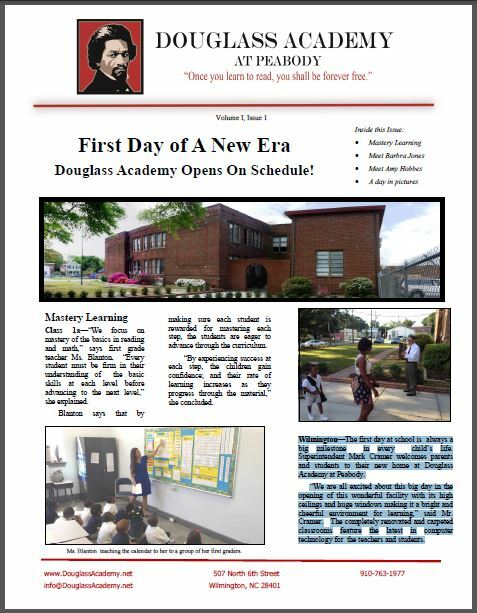 Douglass Academy Opens On Schedule! Wilmington—The first day at school is always a big milestone in every child’s life. Superintendent Mark Cramer welcomes parents and students to their new home at Douglass Academy at Peabody. “We are all excited about this big day in the opening of this wonderful facility with its high ceilings and huge windows making it a bright and cheerful environment for learning,” said Mr. Cramer. The completely renovated and carpeted classrooms feature the latest in computer technology for the teachers and students.